You tell us what you want and we design and produce it. Our authentic style game Shorts are superbly crafted and custom made using only the finest materials. Constructed and crafted like the ones the pros wear design to replicate a pro cut uniform. They feature premium fabric with all sewn-on graphics matching the actual players jerseys. Any jersey you would like, company jersey, fantasy league, pick up team. Always with no set up charges or production minimum orders, in any size, name and number. With stitched-down twill numbers and twill names; mesh or solid design. Tackle twill graphics, with features like stripes and piping made from fabric and sewn in place. Laser cut tackle twill cloth logos in your choice of design. When tackle twill is not used embroidered patches are sewn on the shorts. Tackle twill Cloth logos all will be added at no charge. To Customized: We will be happy to customized these shorts, at no added cost, just enclose your requested when you complete check out and or send us a email with the details. 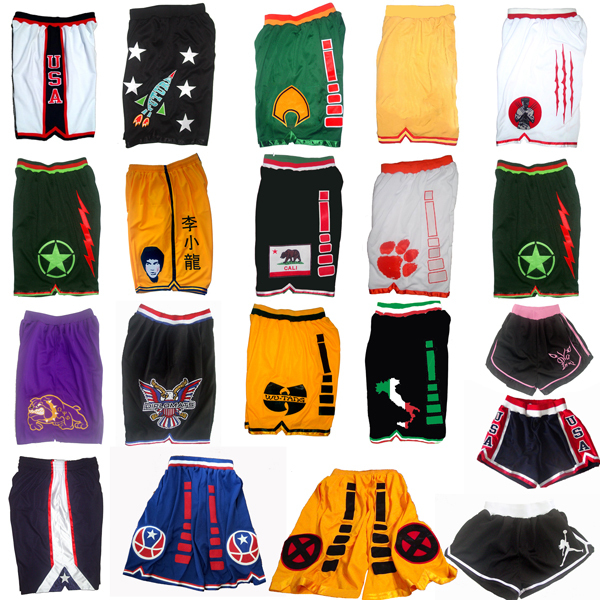 Shorts are custom made to order and offered in a wide range of sizes for the whole family, we will be happy to make them in Mens Sizes, Big & Tall Sizes, Ladies Sizes, or Youth Child Sizes. Authentic style premium quality NBA game shorts All STITCHED / EMBROIDERED, no screen printing or iron ons. Once you have placed the order our office will contact you by email and get all the needed details. Most jerseys can be done with no additional charges, but if we need to produce custom made to order patches a small added fee is required. If you are not happy after we have done a mock up of the shorts you can cancel before production is started. Please allow 7 days for production of this jersey. Ships From Our Philippines Office. Once in production Custom made and design shorts are not returnable. If any questions, comment, or issues please contract us before placing your order.